Croatia ended Russia's unlikely World Cup dream when they won 4-3 on penalties to eliminate the gallant hosts after a dramatic quarter-final ended 2-2 after extra time on Saturday. 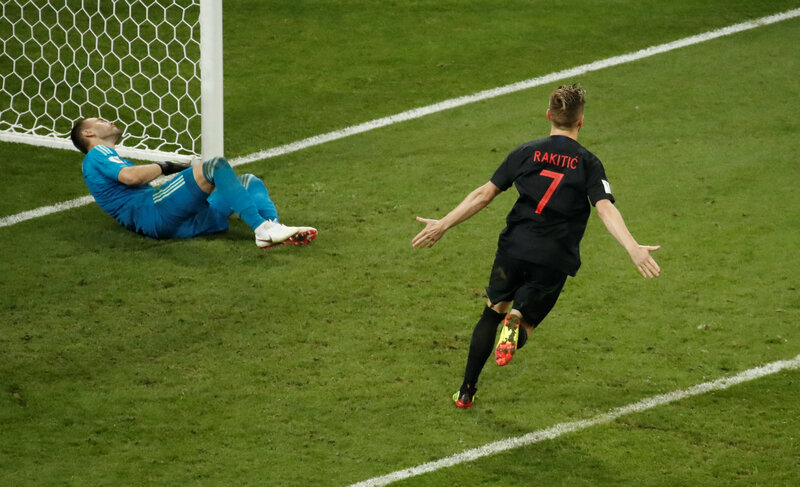 Ivan Rakitic stroked home the winning penalty to send Croatia into a semi-final against England after a night of unremitting tension in Sochi, ending the remarkable campaign of a team ranked 70th in the world. Fyodor Smolov saw Russia's first penalty saved by Danijel Subasic and, although Russia goalkeeper Igor Akinfeev saved a Mateo Kovacic kick, the hosts' fate was sealed when Mario Fernandes fired completely wide from their third attempt. In the previous 120 minutes, Denis Cheryshev rifled Russia in front with a long-range thunderbolt, his fourth goal of the tournament, in the 31st minute before Andrej Kramaric headed Croatia level six minutes before halftime. Croatia then went ahead with a soft header in the eleventh minute of extra time but Brazilian-born Fernandes headed the hosts level with five minutes of play remaining to send the game to penalties. Russia had already surpassed expectations by reaching the last eight, ousting Spain on the way. After a lively opening, the game dropped off, with sessions of head tennis in midfield, but it was Russia's more rustic approach which paid off first as they went ahead out of the blue. But slack defending allowed Croatia to level eight minutes later. Mario Mandzukic ran unchallenged into the penalty area and chipped a low ball back into the centre where unmarked Kramaric scored with a glancing header. Croatia were agonisingly close to scoring on the hour when Russia's defence failed to clear the ball and Ivan Perisic's shot hit the inside of the post but rebounded harmlessly across the face of the goal. Croatia appeared to have the tie in the bag after Vida's extra-time goal until Fernandes rose to head in a free kick and send both teams to their second penalty shootout of the tournament. Earlier on Saturday, England beat Sweden 2-0 in Samara to set up the semifinal clash with Russia at the Luzhniki Stadium in Moscow on Wednesday.